Aloha Friday: Happy 2nd Blogoversary To Me! This post celebrates a few things. First of all, it is Rosh Hashana. This means that I’m offline for a few days (this post was scheduled in advance) and will be spending the time in temple, with my family and eating apples and honey. I have some big plans for the next year. More reviews and giveaways, of course. Also, a redesign of my site and a “How Does That Work?” series. My Aloha Friday question for today is: If you blog, how do you celebrate your blogoversary? If you don’t blog, what do you like to do to celebrate special occassions? congrats on your 2nd year anniversary. I love blogging ,Have never thought about celebrating it. I usually do a post on a recap of why I started the where I am now in the blogging world. How I grew as a blogger. 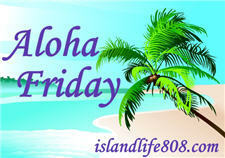 Here’s my Aloha Friday link for youbecause the link below is wrong. My one year Blogversary was this past June, and it was also my birthday. So, I just kind of thanked everyone, and I said how many followers I had to date, and posted my very first Post. Nostalgia I guess. ~hehe~ Many do mega give-aways though I’ve seen. HAPPY BLOGAVERSARY! HAVE FUN! HAVE A GREAT WEEKEND. I didn’t really celebrate my Blogoversary! Sad now that I think about it!